The rise of the 360° images… or not? The new hype in town are the 360° images/videos (sometimes named Virtual Reality or VR) which have gotten a tremendous push in the media in the last months. Companies like Samsung and Facebook (and even Getty Images) are bringing the topic to the mainstream media almost every day since then. When Mark Zuckerberg presented his future view of Facebook for the next years at the F8 developer conference in april 2016, Virtual Reality was one of his key themes. And some days ago Facebook unleashed the feature for everybody to post 360° images/videos on their timeline without having to deal with complexe programming tools. Just record the image/video, upload it to Facebook and everybody will be able to check them in 360° (either moving their smartphones or connecting VR Goggles). Youtube has this feature, too. And Google announced just some weeks ago that it will deploy lots of ressources into this are in the time to come. Samsung on their side presented last year the GearVR in cooperation with Oculus, an affordable VR-Goggle to consume VR media. 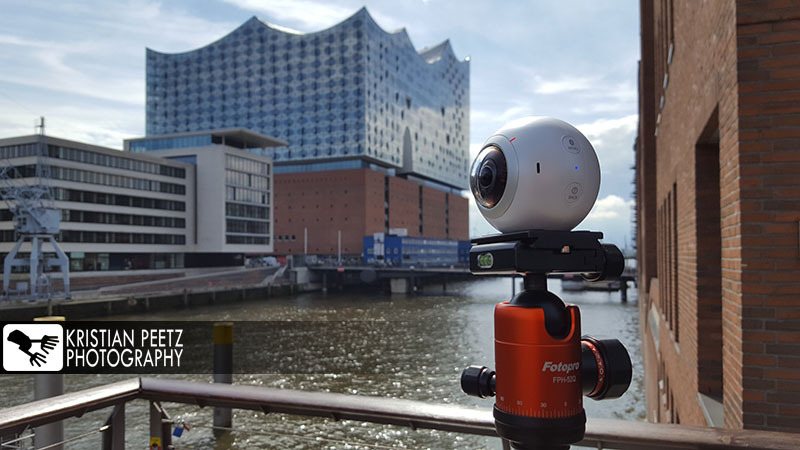 To complement this hardware, they also delivered some weeks ago the Gear360, a small and affordable 360°-camera which allows you to record videos/stills and upload them on the go (at least theoretically). Many other companies are jumping on the 360°-wagon, too, and we will see a bunch of gadgets and hardware coming to the consumer in the next months. 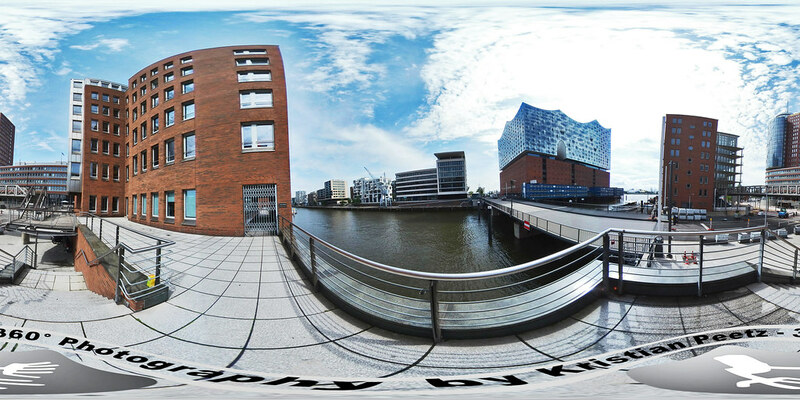 So, what´s all about this 360° media? Well, in the stills or images world (which is my field of action) the possibility of creating 360° images or 360° panoramas is not something new, per se. It´s actually an “old” topic, ´cause photographers have been creating this kind of images since many, many years ago. The difference now is that the creation process is not as cumbersome as it has been up to now. In the “old” days you would have to take a serie of images using a Panorama Head (at least if you wanted to do it the right way) and stitch them together afterwards with a special software. You had to work very precisely and know about zenith and nadir and parallax and yaddayadda… it took time and craft to create this kind of images. And not to forget that the most immersive way to consume or share this images… the VR goggles were not invented, yet. So, the whole 360° images were in a very closed niche. Many photographers looked into the topic, because they are of a curious nature… but very few remained there and were productive. wanna produce 360° images? Take one of the new 360° cameras. No hazzle, no probs. wanna consume 360° images? Take one of the VR-goggles (to fully enjoy the immersive experience) or tilt and move your smartphone. No hazzle, no probs. wanna share and spread them all over the net? No prob… just share them, just a click. This possibilities truly changes the whole 360° images scene. No longer will the images collect dust at specialized sites on the web and only been seen by other photographers… no, now they have the chance to be enjoyed by all the folks out there. And with the affordable goggles out there, this images will finally obtain the glory they deserve. the nice and lovely hotel in an island of Indian Ocean can now put the visitor right into the spot where he would sit down at the beach and sip his cocktail… and he can watch all around. No more wondering how much photoshop has been put into the still… an authentic and real view of the spot! The new and crazy Restaurant in town can show how they prepare the meals in the kitchen or show you how your table will look like… juts as if you were sitting there! Or a museum can virtually show what they have or teachers can explain their topic much more realistically in class. Or a city can bump up the Tourist flow by presenting its places virtually. Or present your local shop or your craft. Or the car brand can let you see and feel like you were sitting in their new car design. Or… or… there are tons of new exciting possibilities for this kind of media. But what about us, the photographers? Is this “new” media worth producing stock images? Well, I am not sure and it is a bit early to say if and how this market will evolve… but one thing is for sure: enjoying the images and videos with the goggles is a real pleasure and it´s a very immersive experience. And this is exactly what makes it unique compared to traditional images: the 360° images pick up more of your mind and senses than the 2D-images. And because you have the option to “look around” it makes you feel like you are there, the visual experience is accomplished by much more senses than only the eyes. It doesn´t get more real and authentic than this. In days were everybody is shouting about getting more realistic, more authentic, more credible images… this kind of imagery “teletransport” the viewer directly to the scene. We are in an age where traditional images are beeing consumed in nano-seconds and this new way of presenting images leads to more time consuming it, looking for details, turning around and identifying the scene. And by the way… for the marketing industry it could lead to a huge gain of detailed information about how, who, when, how much, how often… but this is a topic for another post. Will it become a huge market or will it only deliver to a very specific group ? Only time will tell… but I think I am not wrong when I say that in some years from now on it will be totally normal to see people wearing this devices and consuming VR in all possible situations (home, office, commuting, etc.). Will the 2D-images dissappear? No, certainly not. At least not in my lifetime. Let´s not forget that by shooting 360° imagery the photographer is giving up a lot of visual tools he would normally use for creating an image. Framing? No more. Leading the eye of the observer? Complicated… this, too, is a topic for another post. 2D-imagery will last for many, many years… but the market-share of 360° will expand.